Dr. Monty Gaur is a born and raised Calgarian. During his time in dental school he served as the Student Dental Society President. His internship took him to Asia, Australia and Airdrie (1994). He graduated from the University of Saskatchewan Dentistry program in 1995. Dr. Gaur’s passion for working in a family oriented community solidified his desire to practice in Airdrie, where he has been since. Dr. Gaur, a general dentist, has completed mini residency in Orthodontics and additional training in the areas of implants, Cerec (single visit crowns), oral surgery, laser and cosmetic dentistry, sleep/snoring appliances, sports dentistry, and Botox (aesthetic). Dr. Gaur had the great fortune of having an amazing family physician (Dr. Joyce Clapperton) as a child and strives to have the same genuine concern and compassion for his patients as she did. Dr. Gaur considers that the greatest compliment to his almost quarter century in Airdrie is that he is now treating third generation patients. Dr. Gaur applies this same family feel to his team, where many members are longstanding. One of which is our own, Dr. Aaron McKee, who was a childhood patient. During his spare time Dr. Gaur enjoys time with his family as well as time at the gym, golfing, and playing hockey. As a lifelong C of Red fan, Dr. Gaur is currently living his dream as one of the official dentists of the Calgary Flames. 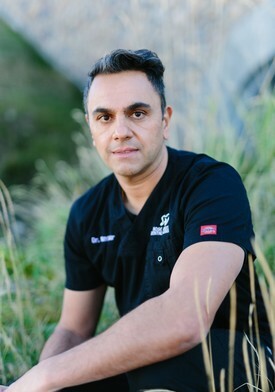 Dr. Gaur resides in Calgary with his fiancée Stacey, their five children and their French bulldog, Sadie. 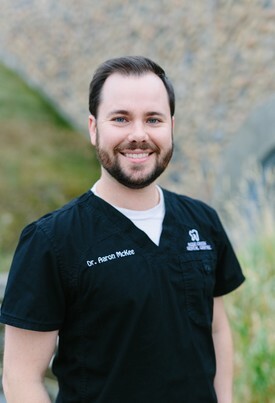 Dr. Aaron McKee is a dentist at Nose Creek Dental Centre (NCDC). He started working at NCDC immediately after graduating from the University of Alberta in 2011. Aaron moved to Airdrie when he was 12 years old and spent his youth playing sports, video games and playing in the school band. After graduating from Bert Church High School, he majored in chemistry at the University of Calgary for three years and then moved to Edmonton after being accepted into the U of A Dental program. Dr. Monty Gaur mentored Aaron and helped him decide that dentistry was the path for him and even offered him a position upon graduating. Aaron chose to become a dentist after job shadowing Dr. Gaur and seeing his relationship with his patients and how he was able to help them. Aaron enjoys the relationships he has with his patients and enjoys seeing families grow over time, especially as his own family has started to grow. Aaron lives in Airdrie with his wife Sonya, his one year old daughter Jacqueline and their two dogs Tess and Rusty. When Aaron is not working he enjoys going on walks with his family, playing board games, and traveling. The most memorable trip he has been on was to New Zealand with his wife on their honeymoon. 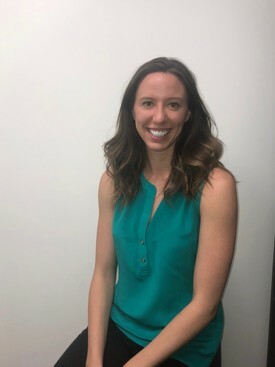 Dr. Lindsay Orser was born and raised in Calgary, Alberta/ After graduating high school, Lindsay went on to earn a Bachelor of Medical Sciences Degree with an Honours Specialization in Pharmacology from Western University. Lindsay then returned back to Alberta and achieved her Doctor of Dental Surgery Degree from the University of Alberta. Lindsay enjoys all aspects of general dentistry with a particular interest in working with kids to make their dental appointments fun and stress-free! It is very important to Lindsay that her patients have a positive experience while they are in the office. She has taken additional courses in sedation to be able to provide patients with dental anxiety a more enjoyable and relaxing treatment experience. Lindsay is passionate about education her patients on their oral health and dental treatment, so don't hesitate to ask her your questions. Lindsay grew up training in the classical ballet at the School of Alberta Ballet. She continues to support Alberta Ballet's performances throughout the year. She also enjoys spending time with her family and being a mom to her cat, Larry.